We began planting at the end of 2000 with around 300 trees, 5 varieties in all, and gradually built up to 450 trees. We irrigated immediately after planting to support early growth, and the mature trees now cope well with the vagaries of Martinborough’s climate. Every season has been a learning experience, the weather producing in turn unwanted rain at pollination, gale force winds and drought conditions. The trees have fruited regardless. Our olive trees have been professionally pruned for an “open vase” shape. The fruit concentrates on the laterals and this makes picking easier and more efficient. Initially we picked by hand, then with plastic rakes and currently we have hand held Italian harvesters with vibrating tynes that shake the fruit from the trees. 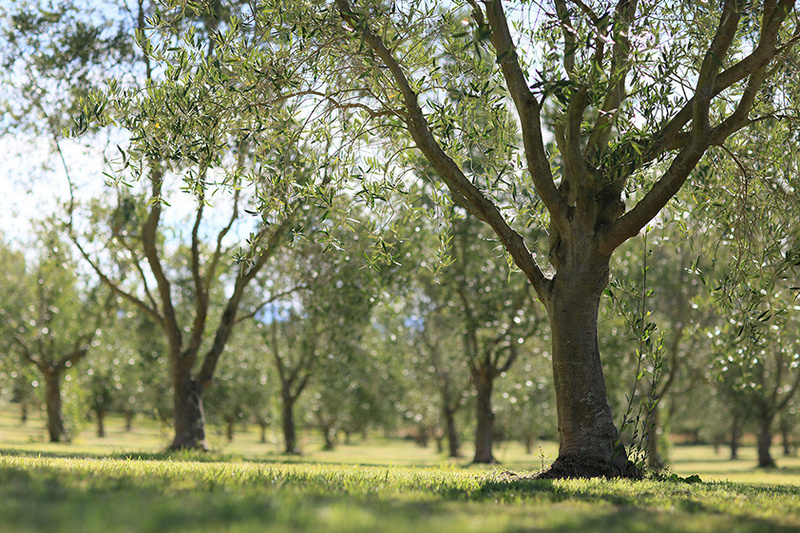 The olives are gathered in nets laid beneath the trees, crated and transported to local Wairarapa presses. In 2013 we took delivery of an Olinet. This unit opens like a large umbrella surrounding the tree trunk. Olives are shaken into the net by the hand held harvester and collected in a suspended crate. The fruit quality and cleanliness is enhanced by avoiding contact with the ground. Regular grove maintenance is carried out using a Kubota orchard tractor with a mid-mounted mower, and a Husqvarna ride-on mower for the tight areas beneath the canopies and in the shelterbelts. An American wheel-mounted weed trimmer takes care of overgrown patches. Spraying is kept to a minimum. Our focus is on maintaining the health of the trees.